Is its Syria Adventure destabilizing Turkey? Riza Saka, a lawyer turned TV pundit, declared that “Turkey has nothing to fear” from the shooting down of the Russian SU-24 plane. In one of the most popular political debate shows on Turkish TV, he declared this suggesting that Russia has much to lose if Putin decides to further escalate the tensions either via implementing trade sanctions on Turkey or by a military response. His argument was not one based on complex economic figures or expert military comparisons but on a futuristic prediction of demographics. The centerpiece of his argument was that “Russia as a country with a steadily declining ethnically Russian population and a Muslim population in the rise, will have a Muslim majority in thirty years time”. Under such conditions he argued that “it is not wise to pick a fight with Turkey, the leader of the Muslim nations”. At first, to an outside observer these rants sound like unworthy products of a provincial mind unaware of the realities of the world. Nevertheless two distinct qualities make them worth mentioning: one; they are actually small nuggets from an immense propaganda machine and two; this propaganda machine is finely tuned to the cultural sensitivities of the majority in Turkey to get an emotional response. The ideological tendencies of the ruling AKP and Turkey’s obsessive entanglement in Syria have to make us question the status of Turkey as a rational actor in the international relations. To understand the propaganda apparatus, one has to understand how the media works in Turkey. The typology of private mainstream media in Turkey roughly divides into two major categories: the media organisations owned by companies or individuals with extremely close ties to the ruling party AKP, and the rest. The first group is pejoratively called the ‘pool’ by the opposition after the leaked audio recording in which several business people are heard discussing the directives of then Prime Minister Erdogan to funnel money into a joint fund aka. the ‘pool’ in order to acquire a media organization for his sake. The parent companies possessing media organisations that are part of the pool tend to receive lucrative government contracts, plus the advertising incomes of their TV channels and newspapers are heavily subsidized by the state owned companies. In return, these media organisations provide services to the government that can be described as Soviet grade propaganda. The TV channels and newspapers run by the pool, fill their ranks with journalists, pundits and experts who either possess an ideological standing close to the AKP or with obsequious men and women whose b-grade credentials under other circumstances would not allow them achieving the level of success they currently possess. The end products provided by these people are strictly controlled in order to avoid negative comments on anything remotely related to the ruling party. Stopping the live feed abruptly if there is a whiff of opposition; alteration of the reality with the help of conspiracy theories, fabricated reports, or blatant lies in order to fit it in with the party line; ad hominem attacks or character assassinations against the opposition; 1984esque editing of the past news reports and headlines (this becoming a necessity as Erdogan and the AKP resort further into ad hoc policies that involve a lot of U-turns) and resorting to a tremendous amount of populist symbolism, are some of the common practices. The second group, which constitutes the rest of the mainstream media, is not a monolithic entity but owned by individuals, companies or power groups with differing agendas and may lean towards opposition or be impartial. This group is kept under government control in a variety of ways; intimidation being the most prominent one. The tools, such as prosecution of the journalists, tax investigations, intimidation of the ad givers, expelling TV channels out of distribution networks such as cable and satellite, and ultimately the seizure of the media organization itself, is utilized to keep the media in line. In addition to these measures some media organisations have positions for the unofficial government commissaries whose role is to be the bridge between Erdogan/AKP and the organization itself. These commissaries transmit the requests and directives of the party and to some extent, control the company’s policies according to these directives. And finally, some prominent pundits are located at the visible end of the control spectrum and propaganda generation. These individuals who are intellectuals or professionals with organic ties to the AKP, in addition to their presence in the ‘pool’ media, are also obligatory ornaments in almost every major political debate program on TV outside the ‘pool’. The main duty of these apparatchiks is to control the story in the instances where the information cannot be controlled. Armed with talking points specifically calibrated to change the direction of the debate positively for the AKP, they can spin on a dime without hesitation. Resorting to populist rhetoric, defamation, ad hominem and lies during the debate, they are rather little ‘pond’ extensions to the big ‘pool’. Additionally, as they are not officially affiliated with the AKP, their comments possess no liability for the political party itself. In the instance of the shooting down of the Russian plane, this multi-layered government propaganda apparatus started fabricating a reality that appeals to the nationalistic sensitivities of the majority in Turkey. In this particular case the job was not necessarily hard as the Turkish state, partly as a component of its nation-building project following the establishment of Turkey; partly, like any other colonialist power, to differentiate and subjugate its colonized population (Kurds in this case) and finally partly to strengthen the position of Kemalist elites in power, applied a comprehensive program of indoctrination of nationalism on its citizens. This was further strengthened in the 80’s and beyond when the Generals of 1980 military coup decided to fight against the threat of communism by using nationalism and religion. No means were spared. The education system, compulsory military service, government controlled mosques and media are all used as tools to indoctrinate people with the nationalistic fervor. In short, Sunni-Turk identity attached to a glorious past (a past rewritten to fulfill the contemporary needs) became a common belief and words like “Turk” or “Ottoman” started to carry a semi-sacred aura. The clearest indicator to the success of this indoctrination is the research done on the voting preferences of Turkish citizens. Although the majority vote for different parties for a variety of reasons, 65% of the voters say that they have the ultra nationalist MHP as their second choice. What’s more, the education system itself has consciously embedded elements and capacity problems that allow the mass being more open to simple messages, which trigger emotional reactions. With only 7.6 mean years of schooling, and 44th place in the PISA index with scores below the OECD average, Turkey clearly lacks the education capacity to provide its citizens with an education that is compatible with the requirements of a competitive world. Yet what’s more important is the conscious choice of an education system that is designed to hinder people from becoming self-governing individuals. Elements such as critical thinking, drawing conclusions out of comparisons and using multiple sources of information are highly discouraged at all levels of education. As an outcome, even before the pro-regime pundits came out of their lairs to alter the reality, many Turkish citizens celebrated the shooting of the Russian plane on forums and twitter without giving a second thought to the possible consequences. Comments like “Russians should not mess with us, the Turks, who are hardened by thousand year long perpetual fighting” or “We will have tea in Moscow in three days, if they attack us” were common. We can’t tell if people are envisaging Russians as a nation that had tea parties for the last millennia; or if they ever considered that Turkey has no borders with Russia and in order to invade it, Turkey first needs to invade a neighboring country, the reactions were clearly emotional, based on the presets of nationalism rather than being products of rational and calculating minds. In the following days Russia started to implement sanctions, placed S-400 surface-to-air missiles in Syria and accused Turkey of smuggling ISIS oil. To counter the negative implications, the AKP government increased the propaganda a notch. Pundits were released equipped with messages such as the one that Saka conveys. And two weeks after the incident, 91% of the population now supports Erdogan in his decision to shoot down the Russian plane. The Turkish style of the Muslim religious Right (much like any other Muslim right wing) desires to turn the tables on “Western powers” and reestablish the might of the Islamic civilization it once possessed. Turkish right wing Muslim groups, unlike other Muslim fundamentalists, have a yearning for the golden days of the Ottoman Empire, and believe that Islamic civilization will shine once more under the banner of an Ottoman style state. The AKP elite and Erdogan heavily influenced by Muslim religious Right thinking, like to view the Levant and northeastern Syria as their backyard and believe tha historical conditions give Turkey, the inheritor of the Ottoman state, the right to at least guide the rest of the Muslim world, especially the Sunni majority in the Middle East. 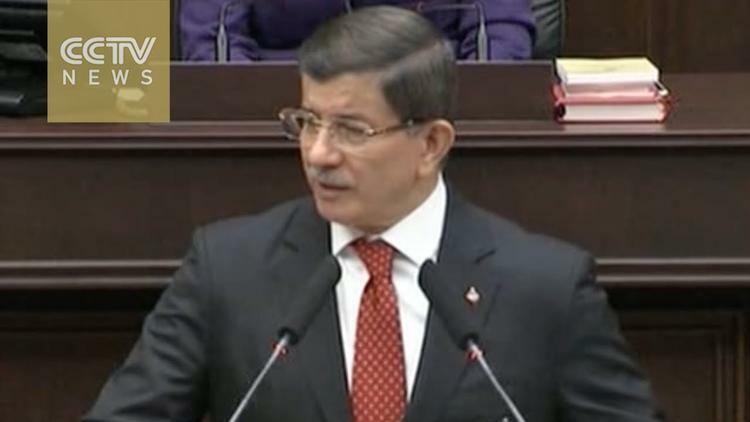 In his 2012 speech then Foreign Minister, now Prime Minister Davutoglu, summarized this by saying that Turkey “is the pioneer [this word can also be translated as “the leader”] of an idea; a new regional order that possesses the might to command the future”. Once the Arab Spring kindled the grassroots democracy movements in the Middle East and started to topple the autocrats, the AKP elite interpreted this as their moment to shine. They believed that with the dictators gone, the conservative rural populations and urban lower middle classes of countries like Tunisia, Egypt and Syria would elect AKP like Islamist parties. In the case of Egypt the idea was to be primus inter pares but in the case of smaller countries like Syria, AKP would be the puppet master. Soon enough, Turkey got involved in the insurgency in Syria with the backing of the US and the NATO. By the time the conditions deteriorated and the insurgency evolved into a full-blown civil war, Turkey was deep into Syria. Even after the Assad regime proved to be more resilient than expected and US and NATO decided to play wait and see, Turkey continued to send weapons, ammunition and aid to the rebel groups. In a leaked audio recording dated early 2014, the head of the National Intelligence Agency of Turkey admits sending over two thousand truck loads of ammunition to Syria. Finally when Russia started its air campaign against the anti-Assad forces in Syria, Erdogan did not hesitate to voice his dislike of the situation by saying “I struggle to understand what Russia is doing in Syria, in the end they don’t even share borders”. The Syrian civil war took its toll inside Turkey too. Four years of consciously implemented porous border policy to provide Syrian opposition -whether they are moderate or Jihadis-, a lifeline caused violent spillovers into Turkey. Several suicide bombers originating from Syria killed over one hundred Turkish citizens in three different explosions in major cities of Turkey. Currently the number of refugees running away from the civil war in Syria and residing in Turkey is estimated around two million, without anybody knowing the actual number. The majority of these refugees struggle to access basic necessities like shelter and food, let alone a stable job to provide for themselves or education for their future. Even if the conflict in Syria comes to a peaceful end, a substantial number of refugees are in Turkey to stay. Turkey’s less than adequate infrastructure is already failing to support these refugees and no one is sure of the long-term impact. Nevertheless, as Erdogan and AKP invested immensely into Syria, they still insist on seeing this struggle as a ‘winner takes all’ game with the main objective of controlling Syria after Assad. In the meantime the rest of the world is on the verge of moving on from the question of Assad as there is no viable alternative in the near or even distant future. Besides, Turkey insists on refusing the presence of a Kurdish polity in the Northern Syria when all major powers involved in the struggle unanimously agree on the Kurds being one of the best alternatives in the fight against ISIS. Of course, the majority of the AKP’s moves abroad have a domestic political interest at their core. Consequently any analysis of AKP foreign policy without covering its domestic outcomes is void. For example in the case of the staple policy of the AKP called the ‘zero problems with the neighbors’, the alternative domestic agenda was to reduce the security risks on Turkey in the interest of reducing the dominance of the military in the Turkish political sphere. In the latest move against Russia the domestic agenda is to stir the nationalist tendencies. A few months before the shooting down of the Russian airplane, Turkey decided to become the champion of Turkmens in Northern Syria as they hold strategic positions on the supply lines of the Syrian opposition groups with close ties to Turkey. But the Russians decided to expand their air campaign to cover the Turkmen held areas to cut the supply lines. Soon after the shooting incident the AKP propaganda machine started to spread the news that the plane was shot down to protect these Turkmens. The idea was to hit the nationalist electorate at home with an emotional attachment to the Turkmen minorities out of Turkey. In the domestic arena, the AKP’s current priority is the constitution it is planning to propose that will bring the changes Erdogan desperately seeks to bolster his power as the president. Although the AKP won the elections held a month ago in a landslide, it is still short twenty seats to pass the constitution straight through the parliament without taking it to a referendum. Therefore the AKP needs the support of the electorate (especially the nationalists) in a possible referendum. Another path is to get support from another party in the parliament to vote for the constitution. In this case, the AKP needs to convince the ultra-nationalist MHP MP’s to get the required number of votes to pass the constitution without a referendum. For any of the above options the support of the nationalists is a sine qua non. Considering the nationalist reaction and the increase in the support for Erdogan following the downing of the Russian airplane and the previous record of the AKP, it is not farfetched to assume that there is also a domestic agenda behind the move. All this finally brings us to the main question of whether Turkey can still be considered a rational actor in international relations? It is a hard question to answer with any degree of certainty. Nevertheless, the Turkish foreign policy makers (most policies are determined solely by Erdogan) have immense ideological, material and emotional investment in Syria that hinders them from untangling and regrouping. Considering what is taking place in Syria is a proxy war that involves the interests of multiple nations, Turkey’s stance in Syria ultimately affects its relations with multiple nations at once. Going to extreme measures like shooting down a Russian bomber plane in order to protect one’s rigid stance, quickly alienates a country, which is not necessarily a quality to look for in a country that prioritizes national interests with rational calculations. The manipulation of the public opinion through the propaganda apparatus makes it virtually impossible for internal pressure to build up to a level to force the AKP government to change its priorities in Syria around the national interests. On the contrary it helps the AKP’s domestic aims as it eases the ride on the nationalist wave. In the final analysis a change in the AKP’s foreign policy can only take place if it threatens the thing that AKP values the most, its term in the government. Considering there is no such threat in a foreseeable future, it would be naïve to expect a rapid change. And if the AKP insists on sticking to its current policies in Syria, it will push Turkey further away from being a rational actor, if it hasn’t done so yet.